Doi Suthep is a mountain, about 15 kilometers from Chiang Mai, with on it Wat Prathat Doi Suthep, a Holy Buddhist Temple. 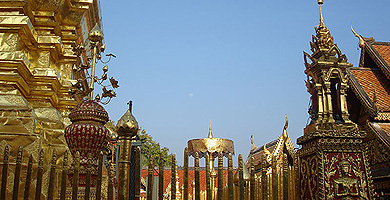 Every Temple with a name starting with Wat Prathat contains Buddha relics and therefore is Holy to Buddhists. The place can easily be reached from Chiang Mai. I would say that it is hard not to find a bus or car that wants to bring you there. As you can see on this page, Doi Suthep certainly is worth a visit. When you reach this Holy Buddhist place, the first thing you will notice is business (left hand side picture), as usual everywhere in Thailand. To reach the Temple of Doi Suthep, climb the stairs (see the right hand side picture) for the best experience. There has been a kind of rail-elevator, that has been closed down after an accident. It was not in operation in 2004. I do not know if this elevator has been re-opened ever since. There are about 300 steps to climb. The reward is more than worth the effort. You will see a beautiful Buddhist Temple and you will experience a beautiful view. While climbing the stairs, you should pay attention to the giant dragons on the sides of the stairs (they appear already downstairs; see the right hand side picture). How was the spot for this Temple chosen? When the Temple was being planned, about 600 years ago, the Buddha relics, to put inside the Chedi of the Temple, were put on the back of an elephant. At the spot where this elephant would stop, the Temple was going to be built. The elephant stopped at the spot where the Temple has been built, which is not the top of the mountain, but roughly just halfway the mountain. When arriving at the top of the stairs, you will see the outer buildings first. The Temple is walled. There will still be some business in this area outside the wall (food and souvenir sellers). The left hand side picture shows one of the entrances top the walled Temple. One of the things you will notice, still in the outside area, are the many Temple bells (rakhang in Thai). Ring them if you like.